China has conducted its second orbital mission this year by launching a Long March 3B rocket with a duo of BeiDou-3 spacecraft for its homegrown BieDou Navigation Satellite System (BDS). Long March 3B lifted off at 23:18 GMT (6:18 p.m. EST) on Thursday, January 11, from the Launch Complex 2 at the Xichang Satellite Launch Center (XSLC) in China’s Sichuan Province. The Long March 3B booster most likely stuck to its nominal flight plan, starting with a short vertical ascent before it began heading in a southeasterly direction. The rocket’s first stage burned for about two minutes and 20 seconds to accelerate the launch vehicle throughout the first phase of the flight. Some 20 seconds later, the first stage was jettisoned and the second stage assumed control over the mission. The rocket’s second stage, burning for about three minutes, continued to lift the spacecraft, raising its altitude. When the second stage separated, the third stage led the mission higher, and was detached at approximately 20 minutes into the flight. Then, the Yuanzheng-1 (YZ-1) upper stage commenced its roughly four-hour-long journey to deliver the dual payload into a medium-Earth orbit (MEO) at an altitude of 13,360 miles (21,500 kilometers), with inclination of 55.5 degrees. China has kept the details about the mission and pre-launch preparations under wraps. However, the information released by Chinese media indicate that the launch was originally scheduled for November 2017, but was later delayed by one month. Then, the officials decided to postpone it once again, this time to January 2018. 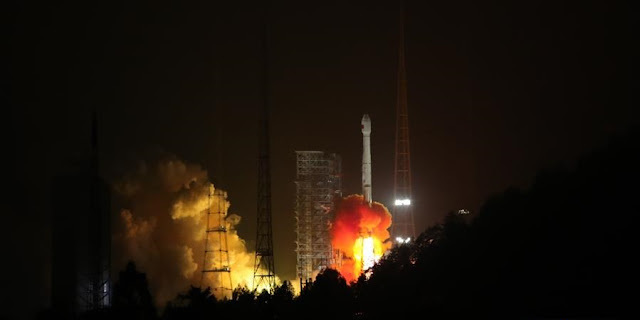 The satellites launched by Long March 3B on Thursday received designation BeiDou-3 M7 and BeiDou-3 M8 (26th and 27th satellites of the BeiDou system). They are based on a newly-developed dedicated satellite bus and weigh about one metric ton each. Both spacecraft have two deployable solar arrays and were designed to be operational for about 12 years. The two newly launched satellites represent the third phase of the BDS system (BeiDou-3). It is the final stage of the establishment of a Chinese space-based navigation architecture. The constellation will consist of 27 BeiDou-3M satellites in MEO, five BeiDou-3G satellites in a geostationary orbit (GTO), and three BeiDou-3I satellites in an inclined geosynchronous satellite orbit (IGSO). “Compared to earlier generation satellites, the BeiDou-3 is able to send signals that are better compatible with other satellite navigation systems and provide satellite-based augmentation, as well as search and rescue services in accordance with international standards,” the state-run Xinhua press agency informs. Named after the Chinese term for the Plough or the Big Dipper constellation, the BeiDou project was formally launched in 1994. The first BeiDou satellite was not launched until 2000, however. Nonetheless, by 2012, a regional network had already taken shape, which provided positioning, navigation, timing, and short message services in China and several other Asian countries. The first BeiDou-3 satellite was launched in March of 2015. China plans to expand the BeiDou services to most of the countries covered in its “Belt and Road” initiative by 2018, and it hopes to offer global coverage by 2020. The three-stage Long March 3B rocket that was employed for Thursday’s flight is a 180-foot (55-meter) tall launch vehicle capable of sending up to 12 metric tons of payload to low-Earth orbit or 5 metric tons of cargo into GTO. For some launches, this rocket could be optionally equipped with a Yuanzheng-1 upper stage. Giaonhan247 chuyên dịch vụ gửi hàng đi hàn, gửi hàng đi đức cũng như dịch vụ gửi hàng đi úc, gửi hàng đi canada cũng như dịch vụ gửi hàng đi nhật uy tín.